SurfEasy is a Canadian based VPN service provider which is now a part of Opera Software ASA. 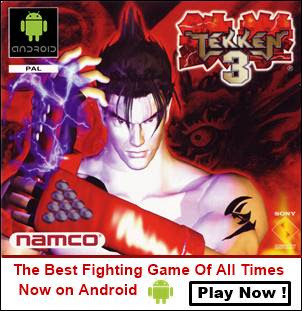 Opera is the developer of the Opera Mini web browser which was the only browser for multimedia phones in the past. SurfEasy is the only free VPN that officially works in a modern browser as well as on iOS, Android, Mac and Windows. By default, the free version can be found in the PC version of the Opera browser. 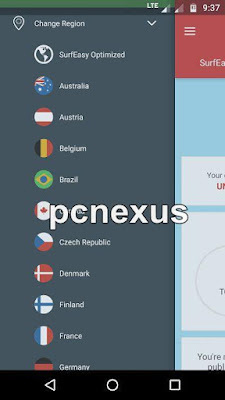 It is the only VPN that is also available for Google chrome as a browser extension. 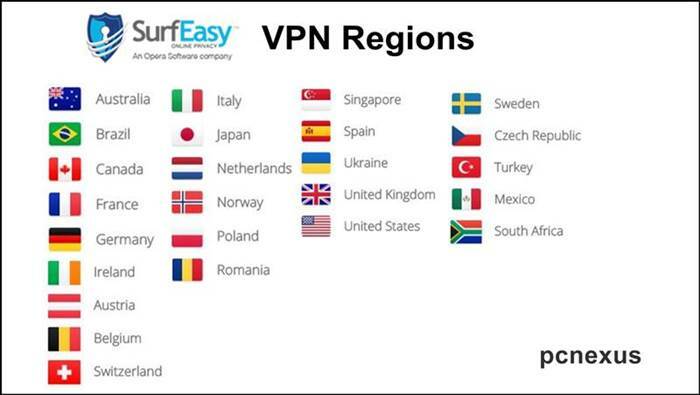 In this post, we are going to review SurfEasy VPN but first, we should start with an introduction of the Virtual Private Network. What is a VPN and what it does? VPN abbreviated as Virtual Private Network is a network security technology which encrypts your internet traffic. It not only encrypts your internet traffic but also hides your original IP address. Basically, a VPN uses a private server address which lets you connect to the internet in a secure manner. Whenever a request is made from a VPN-enabled device then the request gets encrypted. This encrypted information gets transferred to the VPN server via your original ISP. When this encrypted request reaches the VPN server it gets decrypted which in return delivers search results on your phone or PC. The interesting thing here is to note that when your internet traffic gets encrypted then it is almost impossible for someone to see what actually you are viewing on the internet. This technology prevents spam attacks and man in the middle attacks. Even your ISP doesn't know what sites you have visited. Another benefit of a VPN is that you can safely connect to unsecured open public Wi-Fi networks without worrying. And the final and most important use of it is to remove internet censorship. Some websites and services remain blocked in various countries. If a website is blocked in your country then you can't visit it via your original IP address. But a VPN can unblock websites by changing your IP address that points to some other country other than yours. With a Virtual Private Network you can watch region specific content that may be blocked without a VPN. 1. Encryption Technology: SurfEasy uses bank grade OpenVPN protocol for encrypting your internet traffic. The same encryption technology is used by US military and big financial institutions to protect sensitive information. At present, SurfEasy supports IPSec for iOS, OpenVPN for Android, Amazon, Desktop and HTTP Proxy for Browser Extensions. SurfEasy currently provides 256-bit encryption on iOS only. It will be available soon for other software platforms also. 2. Multi-Device Support: When you purchase SurfEasy then you can use it on 5 devices simultaneously with 99.95% uptime. So with SurfEasy you can secure your smartphone, PC, gaming console or your smart TV at the same time. 3. Multi OS Support: SurfEasy has dedicated apps and software for android, iOS, Amazon, Mac OS, Microsoft Windows, and Chrome browser extension. You can download the right VPN client software for your device to secure it from internet threats. Opera browser for Microsoft Windows and Mac OS comes with free VPN service provided by SurfEasy. However, in Opera browser, you can't select your VPN location because it is auto selected. 4. SurfEasy Account: You can create a SurfEasy account to manage your VPN service. After logging in to your account you can download apps and software for various operating systems. You can also see the list of devices that are using your VPN account. You can add/remove devices anytime to make room for newer devices. If SurfEasy registers 5 devices in your account then you can't use it on a sixth device. To use it on a newer device you have to delete at least one device from your SurfEasy account. You can also upgrade your existing plan from your account anytime. 5. Servers List and Location: SurfEasy has a total of 25 server locations. They claim to have 1000 VPN servers operating in these 25 locations. All the major locations are covered including the United States, UK, Canada, Australia, South Africa, France, Germany etc. The servers have 99.95% uptime so you will not face any connectivity problems. 6. Plans and Pricing: SurfEasy VPN offers only three plans. Ultra ($6.49/month), Total ($3.99/month) and Mobile ($2.49/month). The 'Total' and 'Ultra' plans secure up to 5 devices while the 'Mobile' plan is only for one mobile device. The 'Ultra' plan includes additional regions and torrenting support. So you are free to choose among these two plans. If you only want to use SurfEasy VPN on your android or iOS device then choose the 'Mobile' plan. This plan is a little bit expensive than Avast secureline for android which comes at $1.99 a month and works on more than one mobile phone. You can read avast secureline review. 7. Try Before You Buy: You can use free 500 MB VPN data from SurfEasy before actually buying their service. You can earn extra data if someone buys their service from your referral link. SurfEasy doesn't provide a 30-day money back guarantee. 9. Unlimited Data: All plans of SurfEasy VPN provide unlimited data, unlimited bandwidth, and unlimited server switching. You don't need to worry about data capping because it doesn't exist. 10. Customer Support: SurfEasy VPN has a friendly customer support. The customer support can be contacted via your account or any app for a particular device. Your SurfEasy account lets you chat live with a support agent during working hours. If live chat is unavailable then you can submit a request to receive support via email. 11. IP Leakage-Proof: Some VPNs leak your original IP address. If your original IP address is leaked then there is no point of using a Virtual Private Network. But SurfEasy VPN is IP leakage proof. We have tested this with Roesler's WebRTC test page. 12. P2P Support: SurfEasy VPN supports P2P file sharing and torrenting on its 'Ultra' plan. This is the only VPN after avast secureline that support peer to peer connections. The SurfEasy VPN app for android creates a secure encrypted internet connection with just a single tap. The android app is easy to use and have all the functions located at one place. In the app you can select any VPN location from 25 locations anytime. Also you can enable 'Wi-Fi' security for unsecured, public, and open Wi-Fi. Whenever this option is enabled then you can connect to unsecured Wi-Fi networks without worrying. You can also use a widget on the home screen to quickly change the VPN server. From the app, you can also select SurfEasy optimized VPN server which will automatically select the location. Strong encryption technology with OpenVPN protocol. Supports P2P file sharing and torrenting. Also available for a single mobile device. It is a no log VPN. Your browsing history is not logged at all. Dedicated user account to control your service. Add or delete devices anytime in your account. Unlimited data transfer on every plan. 25 VPN locations with around 1000 servers. Only one of the best VPN service which supports a wide list of operating systems. Friendly customer support with live chat option during work hours. You can buy SurfEasy VPN by going to this link below.